Affording an elegant Old World charm with the luxury and sophistication of modern day, Amway Grand Plaza, Curio Collection by Hilton began as the distinguished Pantlind Hotel in 1913. An integral part of the renaissance of Western Michigan, Amway Grand Plaza, with the historic wing and new Glass Tower, is located in the heart of downtown Grand Rapids contributing to the growing skyline of the business and entertainment district. At Amway Grand Plaza, the 682 generously appointed guestrooms, most with breathtaking views of the Grand River, downtown skyline, or sparkling bridges, display restored fixtures and furnishings in the historic Pantlind wing and modern decadent decor and bedding in the newer Glass Tower. While offering unparalleled accommodations, Amway Grand Plaza also features world-renowned dining at various acclaimed establishments, including Ruth's Chris Steak House and AAA Four-Diamond awarded Cygnus 27, and grand venues to host meetings, conferences, and special occasions. Amway Grand Plaza was awarded Best Historic Hotel (Over 400 Guestrooms) for the 2017 Historic Hotels Awards of Excellence. 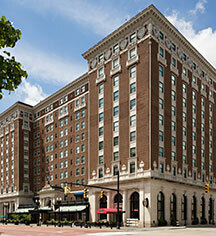 Amway Grand Plaza, a member of Historic Hotels Worldwide since 2012, dates back to 1913. The hotel's intricate details include one of the world's largest gold-leaf ceilings located in the historic Pantlind lobby. Age Requirements: Guests are required to be 18+ years or older with photo identification to reserve a room and check-in. Cancellation Policy: Must cancel one day prior to arrival to avoid fee. For no-shows, charged one night plus tax. Advance purchases are non-refundable. Deposit: No deposit - holds credit card information until check-in. Early Check-In/Late Check-Out: Early check-in: based on unit availability, no charge same day. Late check out: based on unit availability and must be arranged with front desk, fees may apply. Extra Person Fees: Yes, based on selected unit. Hotel/Resort Fees & Taxes: Resort fees: N/A. Taxes: 6%. Parking: Self-parking fee: $29 per night (in/out privileges). Valet parking fee: $34 per night (in/out privileges). RV, bus, and truck parking available. Occupancy Restrictions: Varies per room; can add additions persons for a fee. Payment: Visa, MasterCard, American Express, JCB, Diners Club International, and Discover are accepted. Transportation: No shuttle. Cabs are available; speak with a concierge or a valet for more information. Affording an elegant Old World charm with the luxury and sophistication of modern day, Amway Grand Plaza, Curio Collection by Hilton began as the distinguished Pantlind Hotel in 1913. 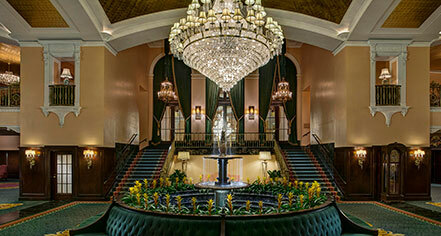 Learn more about the History of Amway Grand Plaza, Curio Collection by Hilton .